Christine is 14 years old. Sadly, 70% of mothers in Bolore and Pagirinya refugee settlements think periods are dirty and 66% of girls and women manage periods without toilets. Having your period in a refugee settlement is uncomfortable, unsanitary and unjust, PERIOD! Influenced by differences in sociocultural norms, without education for young girls on how to manage their periods, whether and from whom they can seek reliable information and help. When a girl faces obstacles in managing her menses in a healthy way, she is at risk for infection, her self-esteem and self-confidence suffer, she may remain absent from school during her period, or worse still, drop out of school altogether upon reaching puberty. Over time, these negative effects add up, preventing a young girl from achieving her full potential and having a healthy, productive life. It’s about justice. WGEF is responding to this crisis by supplying Lucky Girls Sanitary Pads to young girls and women in Bolore and Pagirinya refugee settlements. These 2 settlements host 36,000 people of which 72% are young girls, women and children between 9 to 18 years. 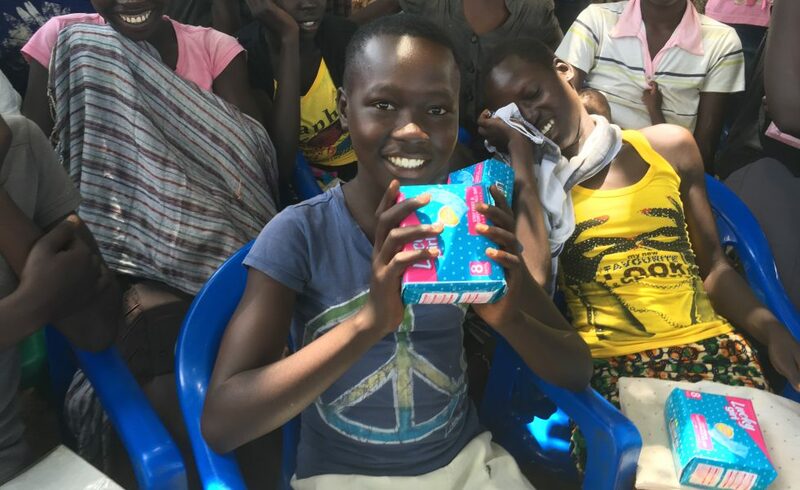 WGEF is committed to delivering 17,000 Lucky Girl Sanitary Pads per month, along with critical information on menstrual health; our goal is to continue making monthly supplies to refugees living in resettlement camps. We hope you are inspired and proud to support WGEF!